The following is an excerpt from the July issue of PVNews. Subscribe now to view the top ten utility PV developer rankings. 2011 will be the first year that utility-scale PV ranks as the largest segment of the U.S. solar market (see this article by Shayle Kann). In 2012, GTM Research forecasts more utility-scale solar will be installed than residential and commercial applications combined. By 2013, the U.S. will install utility-scale PV in the multi-gigawatt range. But, as of the end of March, the total installed utility PV capacity in the U.S. was just 400 megawatts, with 32.9 megawatts of that connected in Q1. There is still a void to fill to reach the gigawatts of capacity expansion that are expected to come online in the next few years. The two largest developers, First Solar and SunPower, have pipelines in the multi-gigawatt scale, and all of the projects listed in this article have signed PPAs in place and are likely to see completion. 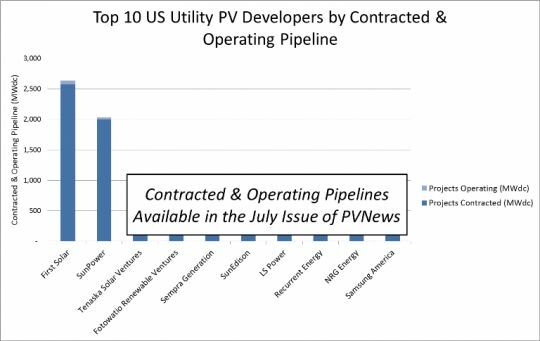 Filling out the top ten are developers with much smaller pipelines, and they are hungry to grab a bigger piece of the utility-scale PV pie. This high-level analysis of utility PV development trends is drawn from the recently released GTM Research U.S. Utility PV Market Tracker, which is updated continuously with new project details and development-related news. First Solar and SunPower are the two gorillas in the room. These large, vertically integrated players have been active in project development through strategic acquisitions of pure-play developers. First Solar acquired Nextlight and Optisolar’s project pipeline, and SunPower scooped up PowerLight. Armed with large balance sheets and an upstream component channel, the development arms of these two companies can aggressively and confidently bid on massive projects. SunPower’s potential balance sheet just grew substantially, as the company was acquired by Total -- provided the new parent company regards developing projects as a prudent decision. First Solar has already completed the 24.7 MWdc Blythe and 34.5 MWdc Cimarron plants. Currently under construction are 23 MWdc worth of projects for PNM, which should be completed in 2011, and the 333 MWdc Agua Caliente plant. The biggest news surrounding First Solar, however, is the recent announcement from the DOE of loan guarantees for three more of the company's projects. In addition to the $967M loan guarantee the firm received for the Agua Caliente in January, the DOE has offered another $4.5 billion worth of commitments for the AV Solar Ranch, Desert Sunlight, and Topaz solar plants. SunPower completed the 20.6 MWdc Greater Sandhill project in 2010. The 17.2 MWdc Luke Air Force Base and 29 MWdc McHenry plants are expected to come online in 2011. In 2012, the 287 MWdc California Valley Solar Ranch could be up and running. The difference between the second and third place slots on our list is quite significant. The firms occupying the lower seven spots rely on two different models when developing projects. For example, Tenaska rates the third place spot with only two projects (both CPV), which total 328 megawatts. Subscribe to PVNews now to continue reading!